The steering box is mounted to the frame further forward on 4X4 trucks. For lifted 4X4 trucks with crossover steering the steering box gets mounted to the frame in the 2X4 location, further back on the frame rail. The box on a 4x4 is mounted to a bracket that is mounted to the frame, I think the bracket is mounted in the same place as a 2wd box. I have a 78 4x4 frame out in the field. Tomorrow I'm going to take one of the brackets that I have and see if it will fit. No, the box/bracket is mounted further forward in 4X4 trucks. When you look at your 4X4 you will see the holes for the 2X4 mounting position further back on the frame. Well the verdict is in. The mounting holes are in the same place on both 2 and 4wd trucks. The plate that is used to mount the steering box on the 4x4 is held on with only 3 bolts and only uses 2 of the 4 holes that are used to mount the 2wd box. It is 17" from the top bolt hole to the end of the frame on both trucks. Check out the pictures. 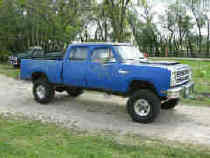 This is the 2wd. I went the extra step and installed the bracket and the plate. On the 4wd you can only use 4 of the 5 bolts that you would use on a 2wd. and one more from the outside of the frame. Good work! That also explains why the factory parts books list this brace for both 2wd and 4wd starting in 86. I have also been told that the bracket you show in this picture ia also available in a heavier duty design that was used on the later year trucks, it's just that the frame holes have to be enlarged.